A few weeks ago, Tara commented that she didn't see the point in being frugal, frugal, frugal just so she could be a millionaire when she and her husband are 80! What is the fun in that?? Maybe some of you have had the same thoughts as you've thought about coupon-ing, garage sale-ing, eating at home. 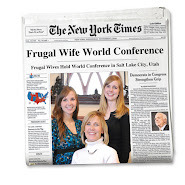 . . Hopefully, I can give you a glimpse at where this whole Frugal Life thing is really headed. If you have credit card debt, car loans and/or student loans, most people (when you finally get very serious about it) can pay all of it off within 3 years. We have never carried credit card debt, but we've had a few car loans and we had over $60,000 in student loans back in the 1980's -- so about $130,000 in today's money. We paid minimum payments for a number of years, and then we got religion. We paid off our car in about 8 months and our student loans in about 2 years. So we paid off all our consumer debt in right around that 3 year mark. We weren't making tons of money and we had 3 children. We were extremely average. You could probably pay things off faster than we did. Our next step was paying off our house. We knew a couple of families our own age (early 30's) who had paid off their houses. We were AMAZED. Could we do that too?? How long would something like that take? We owed about $160,000 on our house at the time. As a little family we confronted this monumental financial goal with everything we had. We printed out an amortization schedule (numerous pages of small type -- very scary), and taped it ALL to the back of the door where the bills were paid in our house. Every month when we paid our regular house payment, we also added as much extra $$ as we could scrape out of our home budget and sent that along to the mortgage company too -- that extra money goes straight to the principle. We often gathered our 3 girls into the room while we marked off the payment amount with a highlighter pen and circled all the skipped interest payments that NEVER HAS TO BE PAID-- EVER!! Did we starve through this time? Live on nothing? Never leave the house? No, we actually took a few pretty decent vacations along the way and fed and clothed everyone. Probably saw a few movies too. But we stuck to our house payback schedule. We threw everything we could at this debt and in 3+ years we received our title, free and clear, in the mail. That is a moment never to be forgotten. We paid that house off in 1996. In 2003 I wanted a bigger house (we had more children, the older ones were larger, and we wanted to live in a better school district). We found the house we wanted and went back into a $100,000 mortgage (we were able to pay for MOST of the house with cold, hard cash from the sale of our first house -- that felt very, very nice). We paid off this new mortgage in about 2 years. I thought I would mention here that both times we got down to the last $30,000 on our mortgage, extra money just started appearing. I can't even explain it. It's like the Lord knows you are serious about taking care of your family and your finances, so He blesses you beyond anything you've ever seen. The last $30,000 was paid off about 5 months earlier than scheduled -- both times. When you get to that point, let me know if this happens to you too! So, when you've paid off all of your debt -- in under 5 years probably -- how does life look? It is an amazing place to be. Think of the amount of money you bring home every month in your paycheck. Now think of how much it would cost you to live with no major bills. No credit card payments, no car loans, no student loans, no house payment. Can you even wrap your mind around that? You still have to buy food, electricity, gasoline, car insurance, clothes, property taxes. That's about it. Hmm. How much would that add up to in a month? Not very much. All the rest of your take home pay is YOURS. Wow. Saving is a big thing. Putting as much money as you can into tax-free or tax-deferred programs is very smart. Beyond that, you can spend it on anything you want. You could buy a new car with cash -- every few months! You could buy a brand new boat in cash, also in just a few months. You could redecorate your entire house. Put in a backyard pool. You can be generous beyond anything you can imagine. Travel to Europe, Asia, Africa -- every few months. All for cash. You will finally be free. All the hard work you (or your spouse) puts in to bring home money, will finally benefit YOU. All in about 5 years. Labels: Becoming Frugal, Budgeting, Buying a Car, Coupons, Credit Cards, Eating Out, Housing, Investing, Living on Less, Saving, Travel, Why Be Frugal? This is amazing. I've been struggling, too, with the idea of saving for some far-off future (like retirement, which is around 30+ years away for us). But to think about how much of our monthly income goes to what I consider "good" debt- our mortgage and car loan- being totally gone...whoa...that is incredibly significant!!!! I love the personal experience you shared here, thank you! I love reading your posts because where you were is where we are now and where you are now is where we hope to be someday. You give me such hope when I think about the horibble monster that is our student loans! I know we can do it and I know the Lord will bless us! This was a great post. We're currently working toward paying off our home and I can't even imagine how much we'll be able to save when that huge chunk of money isn't coming out of each monthly paycheck. Hallelujah. Ah, it does look nice. I have high hopes that this will be us. A crucial part you only implied is that you must have had some sort of decent, stable income. I don't mean super wealthy, but decent. That's the part I'm looking forward to more: a real income. I know that all that other stuff will be possible once we get to the point that my husband isn't in school and we have a predictable, steady income (even if it isn't very big). My fingers are crossed that happens in about four years or so. I just keep telling myself, that really that isn't as long as it sounds! I love this blog. When we were first married, we got into a lot of debt. Once we decided to buy a house, about three years later, we decided that paying everything off before would be a great idea. So we did, and I was amazed at how quickly we paid it off, plus saved a significant amount for a down payment. We have always paid about an extra $100 a month to our mortgage payment, which means we end up paying an extra payment a year, but this whole paying off your mortgage in three years thing really has me thinking. I don't think I would have ever really thought it was possible. s post was just what I needed to motivate me to save even more. I am totally going to make an amortization plan and tape it to my pantry door. Can't wait to be debt free! This was definitely inspiring! My husband and I want to pay off our mortgage, and we're slowly getting there. Glad to know that other people have done it, too, and at a young age! We've actually made a plan to pay off our mortgage in 4 years- however, we have very significantly cut down our retirement savings to do this. With the low interest on our mortgage and it being tax-deductible, I'm hoping we're making the right choice to get it paid off first. I want to do this to free up some cash to travel, but also as sort of an insurance policy because my husband is diabetic and is pretty much impossible to get life insurance on, and I'm a stay at home mom. I want to have the peace of mind that if I should suddenly be left without him, I'd at least have a home for myself and our children. What do you think about cutting retirement savings in order to pay down the mortgage? Sheyenne: I'm a HUGE Dave Ramsey fan, as you've probably guessed. He recommends that you continue to pay 15% of your income to tax-friendly retirement plans while you pay off your house. He knows a lot more about money than I do, so I take his word that this is the way to go. Go to the Dave Ramsey home page and read through his Baby Steps plan. He explains things very well. Thanks for the reply. Everyone talks about Dave Ramsey but I've never actually checked him out. I'll take a look and see what I can learn. Becca: I would recommend setting small goals in paying off your student loans. Work on $10,000 or $20,000 off at a time. Then take a couple of months off from paying extra and do something fun with your extra money. You would only have to do this about about a dozen times to have the debt completely done. It will certainly take you a few years, but you'll get there -- and way before you're in your 40's. Go to www.bankrate.com and plug your loan and interest rate numbers into one of their mortgage calculators (they work like any other loan) and see how much in interest you'll pay if you don't pay off early. I took the liberty of plugging in some guess numbers for you. If you have $180,000 in debt at 6.25% for 15 years you would pay $97,805.07 in interest -- above and beyond the original $180,000 you currently owe. If your loan has a lower rate of 4.0% then you'd pay $59,658.81 in interest. The vast majority of your interest payments are going to be in the first 5 years of this loan -- you'll be paying very little toward the principle, unless you pay off early (that is ALL principle). So, to pay a bit ahead at this point (or whenever you have to start paying) will save you most of that interest. Waiting 5 or 10 years to finally start paying extra principle will not save you all that much because the interest will have already been paid to the bank. Obviously this is your life and you can do what you want. But wanted to give you some things to think about. Good luck!! And I LOVE Palo Alto! So beautiful!! Was just there on Monday. It'll take awhile, but we'll get there. And I think the journey will be just as great as the destination in most ways, though it's certainly hard to be patient sometimes. Good thing Elder Uchtdorf covered the topic of patience just the other day! Thanks for the encouragement. Doesn't everyone have those days where you swear you'll never be able to pay anything off? And this is not crazy irresponsible consumer debt or anything! I know there are different loan repayment programs (some subsidized by the fed gov't), but I like the idea of just paying huge chunks at a time. Something that haunted me well before I met Ty was that at the Y, my (twin) friends' dad was still paying off his med school debt, and he had three children in college. Ty and I just went on a long walk about a week before you posted this, talked about finances, got a little discouraged at how long it'll all take, etc, but then after you posted this, I was like, "TY! You have to read this thing my friend's mom posted!" It really is great for kids our age to get this kind of encouragement. Thank you! !